Prater’s Mega Mill Hammer Mill was manufactured with the intent of bridging the tough gap between hammer mills and fine grinders. Our Mega Mill provides uniform grinding with less heat build-up and a unique bearing and shaft arrangement that creates a smoother, quieter operation, 24 hours a day and 7 days a week. Tests have continuously shown that our Mega Mill machines run more efficiently and at a lower volume than conventional hammer mills while providing reduced downtime, maintenance and power requirements for an all-around convenient, cost-effective product that will help, instead of hinder your material processing. Additional key features include a -40 mesh particle distribution, a single-latch door for easy maintenance and cleaning with absolute clean-out front access, dynamic rotor symmetry to assure superior balance and uniform hammer wear and an o-ring sealing door for a dust-tight operation. The Mega Mill can run 24 hours a day, 7 days a week on a consistent basis without issue. Because of the reduced downtime, maintenance and power required to operate, many customers have already discovered that the Mega Mill paid for itself within two years from energy savings alone. 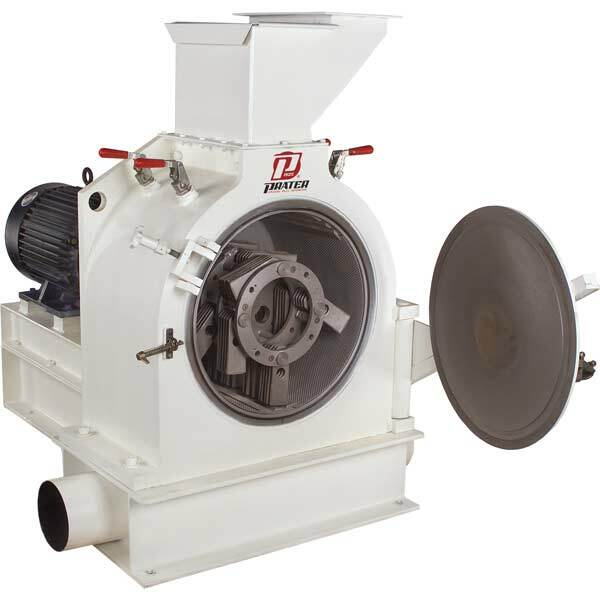 With versatile applications including animal feed, cereal, fertilizer, sugar, spices (salt, chili pepper, nutmeg, paprika and more), wood shavings, wood chips, wood waste, whole soybeans, diatomaceous earth and various grains (rice, oak, wheat and more), the Mega Mill Hammer Mill is ideal for any size operation. View/print Prater Mega Mill Hammer Mill product information document here. Test show that Prater Mega Mills run quieter and more efficient than conventional hammer mills.